Everyone is having social media accounts but there is a difference between basic user accounts and celebrities users accounts, and that difference is blue tick mark beside your user name, which us called Verified Badge. Earlier its hard to get verified your twitter account, but now you can try to verify it simply by filling a form. Yeah.. You read right you can verify your twitter account. Twitter has created an official process to have your account verified, proving once and for all that you are who you say you are on the site. It's not a sure thing, but at least there's a way to get your request in front of someone without going through back channels. There are several account requirements before you can even submit a request. For example, you need to have a profile picture, a verified phone number, a verified email, a birth date (for personal accounts), and so on. When submitting a request, you'll need to supply at least two links that help verify your identity and noteworthiness. You will also be asked to upload a photo ID (Twitter says it may ask for this, but it's on the form). First read the above requirements details for the verification. You should have added your contact number on your twitter account that you want to verify. If you have required details then Fill this Request Form, and complete all the necessary details. After sending the verify request, sit quite and be calm. 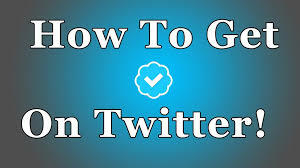 Twitter team will contact you via email that is been used with your twitter account. That's it after twitter team verify you as genuine users you will have a verified badge on your account. Note: You may asked for scan and upload a legible copy of your government-issued ID (such as a passport or driver’s license) to confirm your identity. Please check all the details for account Verification Here. Is this article help you? Share in comment.